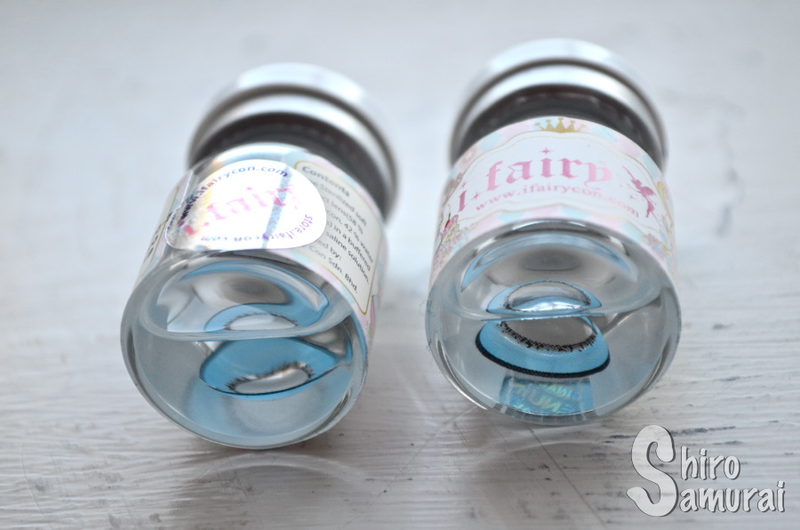 If you're familiar with circle lens styles you might notice that these have exactly the same design as the popular Princess Pinky Eclipse series (I've reviewed the pink ones here). I can say though that, while the design itself is pretty much identical, the main difference is that the I.Fairy Moonlite series is a lot more vivid and opaque! Yeah, these are so goshdarn vibrant that they show up virtually anywhere, no joke. You can't go wrong with these if you're looking for super-vibrant color that will show up no matter your natural eye color! The Moonlite series is the crowned king of vibrant color coverage. Period. 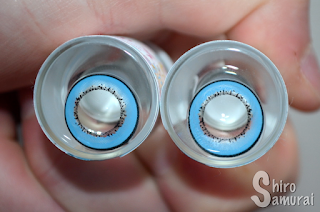 As you can see these are big and so obviously blue that if someone misses that you're wearing lenses then they are either blind or six feet under, lol. These have a really bright light blue color, kinda like some neon sky blue. The color is seriously amazeballs! 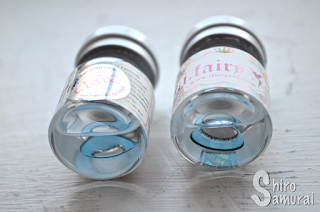 The Moonlite lenses are really enlarging, just like I.Fairy lenses in general – thou shall not expect I.Fairy lenses to be anything but big. ;) The comfort is pretty good too! I had no problems inserting them and my eyes adjusted themselves to these lenses really quickly. I don't really feel that I have them on and they don't sting nor anything; I don't get colored corners in my vision field either, thanks to the generous pupil hole. They start to feel slightly dryish around 3 hours but that's pretty good for me, seeing how my eyes are dry and sensitive more often than not; I can wear them for over 5 hours with little to no problems. Oh and yeah, speaking about my eyes, I guess it's worth mentioning that I'm a light-eyed person (duh!) and my eyes are something like a blue-gray but with an occasional greenish tint. All photos taken by me during an April afternoon with a completely cloudy sky and hints of snow falling. All close-up photos are free from color filters and such and that's so that the colors would be as true to real life as possible. Orange-ish staircase light, with natural light (window) coming from the side. Outdoors, facing light but sitting under the shadows/roof. Outdoors looking up into the sky. Notice that even in the poorest light conditions these are unmistakingly still a vibrant blue! 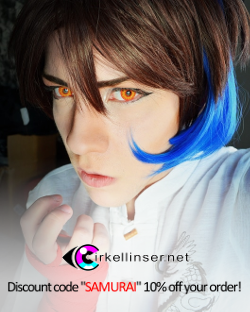 :D I don't even need to show you what they would look like in bright sunlight because even when it's bloody cloudy outside these lenses scream "I'M SO BLUE I COULD SLAY YOU WITH MY INTENSE BLUENESS", haha. They show up from any distance too, which is always great if you're being photographed etc. :) The Moonlite series really don't cheap out on the color coverage and intensity! I honestly can't recommend these enough for cosplay! 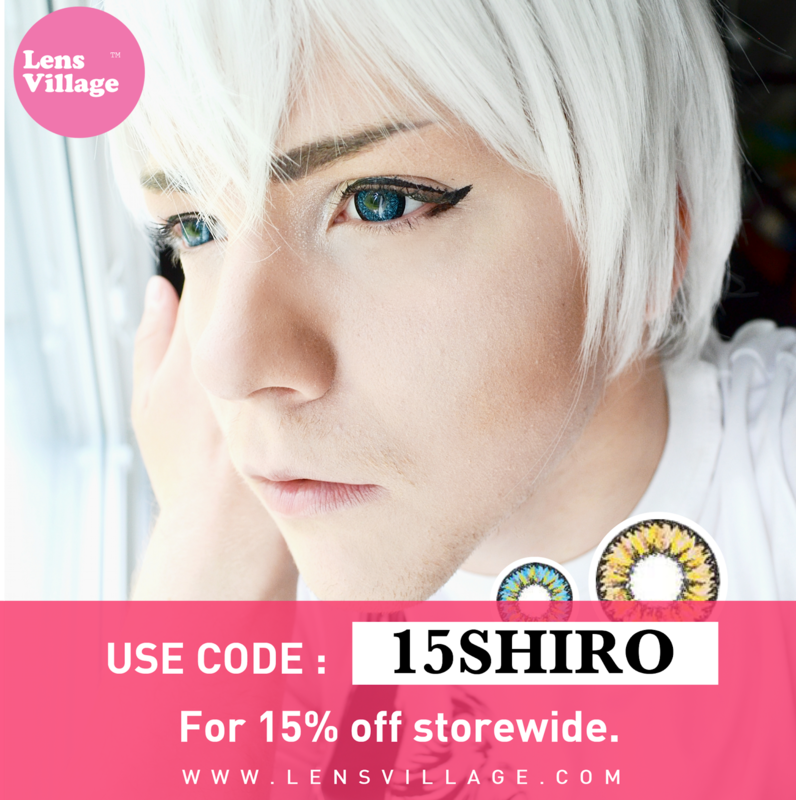 They'd be great for any character with light blue intense eyes or for a myriad of Pokémon gijinkas and such! Personally I used them for Darkrai and it looked fabulous. I seriously can't recommend these enough. 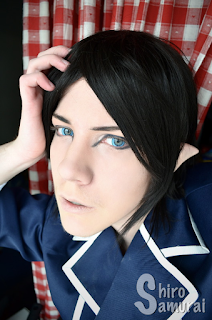 I went for an elven prince look or something, heh. 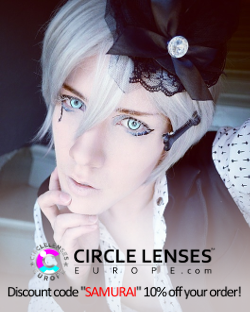 I want to mention that the I.Fairy Moonlite lenses are a fairly new addition to the circle lens market – I remember they didn't exist a couple years back, if even that. They come in a variety of common and rare colors and are perfect for anything from funky, odd to extreme fashion! 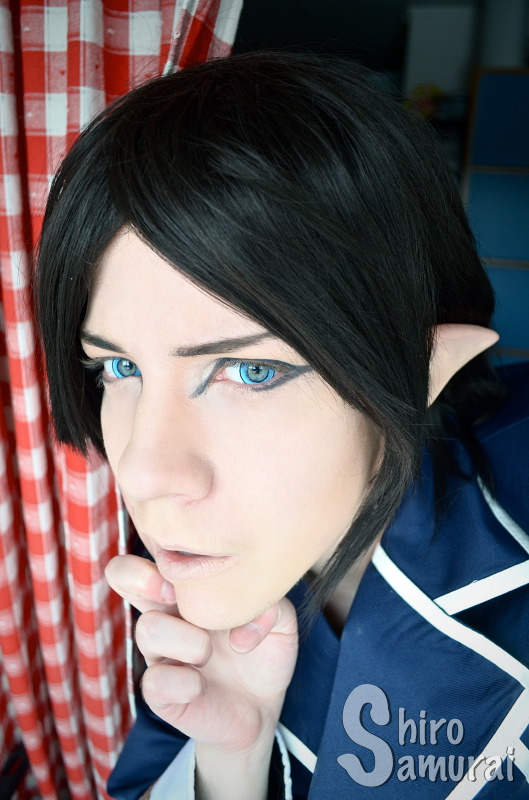 I seriously love these lenses and I would definitely repurchase them if I need them for any future cosplays. Incredibly vibrant light blue color that everyone –and I mean everyone– will notice! Features a dotted inner circle and a single color. 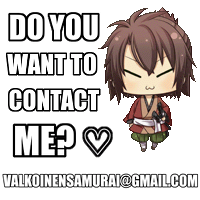 Very versatile and cosplay-friendly! 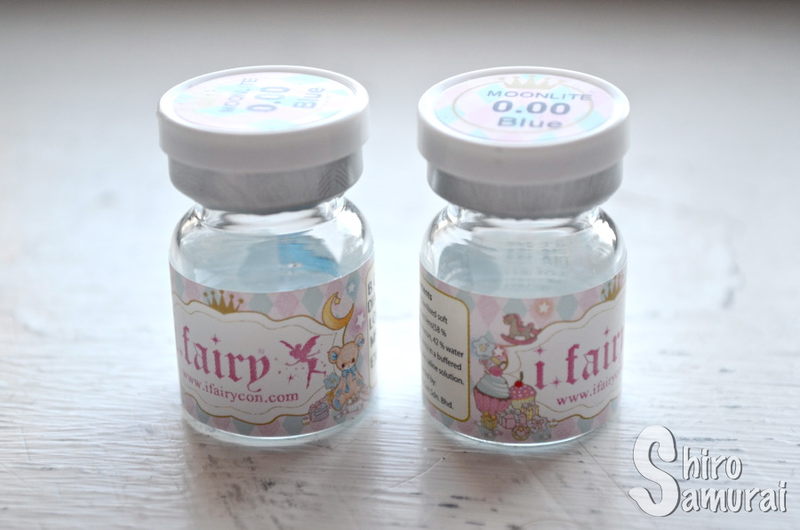 These are a godsend in coverage and a definite "must have"! Leaves nothing to be desired. Provides a big eye look but it's not overly dolly since the limbal ring is thin. Pretty good! I don't really feel them and can wear them for 5+ hours without any real problems, save for some occasional dry feelings. 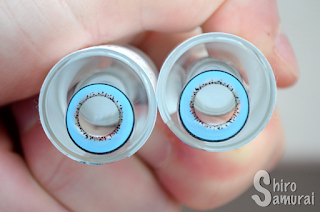 Who buys this kind of lenses and expects them to be natural?